Oh, my goodness ... that is one lengthy recipe title, isn't it? I wanted to be sure to get all of the main components of this recipe into the name. I'm sure, however, that once you try these bars, you'll care not what the name is or how many words are involved in the title. Baking actual cookies is not one of my strengths. Not because I fail at it (usually), but simply because I'm a pretty impatient girl. (Is it okay to still call myself a girl at thirty-seven?) I hate waiting in between each batch. I hate the process of spooning dough onto a tray, waiting twelve minutes for each tray to bake, then repeating the steps over and over again throughout four or five spooning/baking cycles. More often that not, I get busy doing something else while a batch is baking, then I have a tray (or three) of burnt cookies as a result. 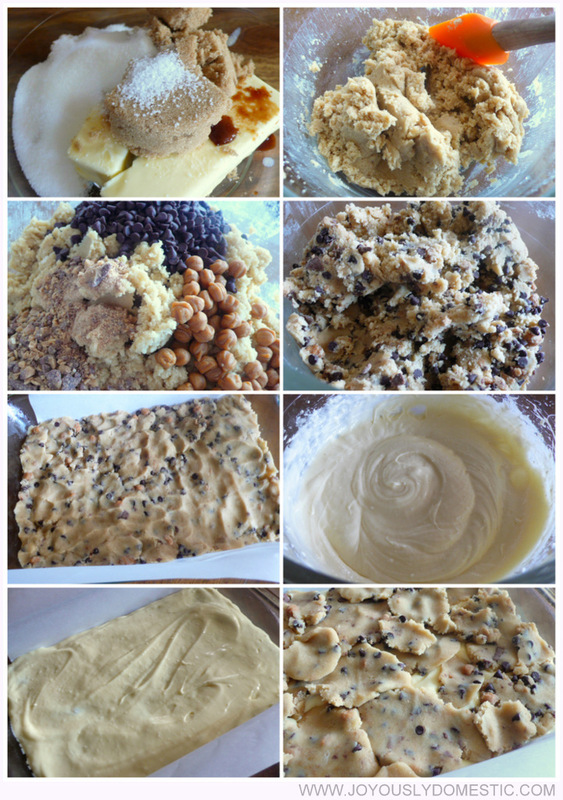 So, I'm thrilled when I can take the concept of cookies and turn them into a one-pan recipe. Mix everything up, assemble everything into the pan, pop the pan into the oven, let it bake and be done with it. But, that's not the only reason I love these bars. 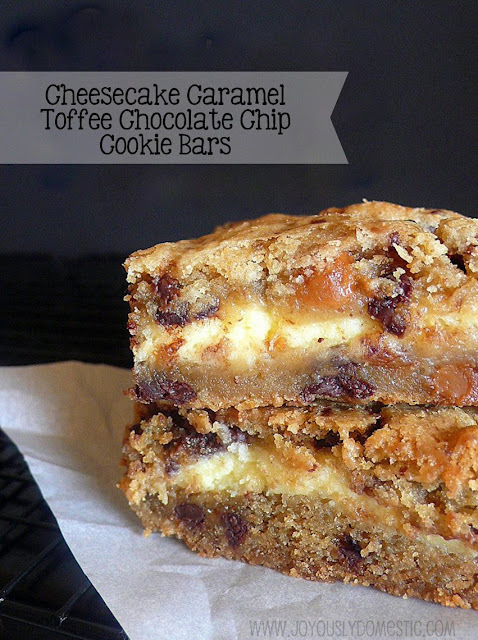 This recipe combines my love of cookies with my love of cheesecake. Plus, it has some toffee bits and caramel bits thrown in for my pleasure good measure. If you're not familiar with caramel bits, they can be found right in the chocolate chip section in your supermarket. They are made by Kraft. They come in an eleven-ounce bag and cost around three dollars. They are super adorable (well, as adorable as little balls of caramel can be). They are just like Kraft wrapped caramel candies, but in little ball form - perfect for baking. Prep a 9 x 13 pan by lining it with parchment paper. Set aside. Cream together the butter, sugars, salt and vanilla. Beat in the egg, then the baking soda and flour. Stir in the chocolate chips, caramel bits and toffee pieces. Divide mixture in half. Spread half of the dough evenly into the prepared pan. I use my fingers to do this. Set aside. In a medium bowl, cream together the cream cheese and white sugar until fully blended. Beat in the egg and vanilla. Mix until completely smooth. Pour and spread cheesecake layer over the pressed cookie dough layer. Using your hands, press pieces of the remaining dough into flat discs. Lay on top of the cheesecake layer. You don't have to have the entire cheesecake layer totally covered. In fact, leaving a bit of the cheesecake layer peeking through in spots looks good once the bars bake and cool. Bake for 20 - 30 minutes or until the bars are cooked through and top is lightly brown. Allow to cool completely before removing from pan by way of the parchment paper. Once cooled and removed from pan, cut into twelve equal bars. Store in refrigerator. NOTE: If you use the caramel bits in this recipe, allow the bars to come almost to room temperature (after refrigerating) prior to serving. The caramel bits harden up a bit in the fridge. These look absolutely incredible! What I wouldn't do for one right now! :) Thanks for sharing! Hi, Carol. These are just plain sinful! :) We've really been enjoying them this week. Thank you for stopping by! Oh my goodness, this looks too delicious. I must try it! All the elements of a cake that I adore put together. Total bliss! In the oven right now! YUM! Milk chocolate chip or semi-sweet? These are in my oven for the second time this month because they were such a huge hit the first time! I was going to make these for a family reunion and my husband says, "that would be a waste....I wouldn't get very many"! LOL! Thanks for a great recipe! i am going to try this vegan style. . im so excited. . i will let you know how they come out! And the calorie count is.....???? Do you think this will work with pre-made cookie dough? As in the tube of Pillsbury dough? So glad it was enjoyed by all. And, thank you for the feedback. Love hearing when a recipe here is a great success for my readers. :) Thank you. For the cheesecake is it granulated or icing sugar? © 2012 - 2019 Angela Steveson | Joyously Domestic. Powered by Blogger.